Quick definition: Profit margin (also called operating margin) shows how much profit your business makes on every dollar of sales, before paying interest payments or taxes. It is usually expressed as a percentage. So, if your business has a 10 percent profit margin, that means that 10 percent of your sales are left over as profit, after you’ve paid all of your regular expenses such as salaries, rent, and raw materials. Profit margin (or operating profit margin) is usually displayed on your company’s income statement. 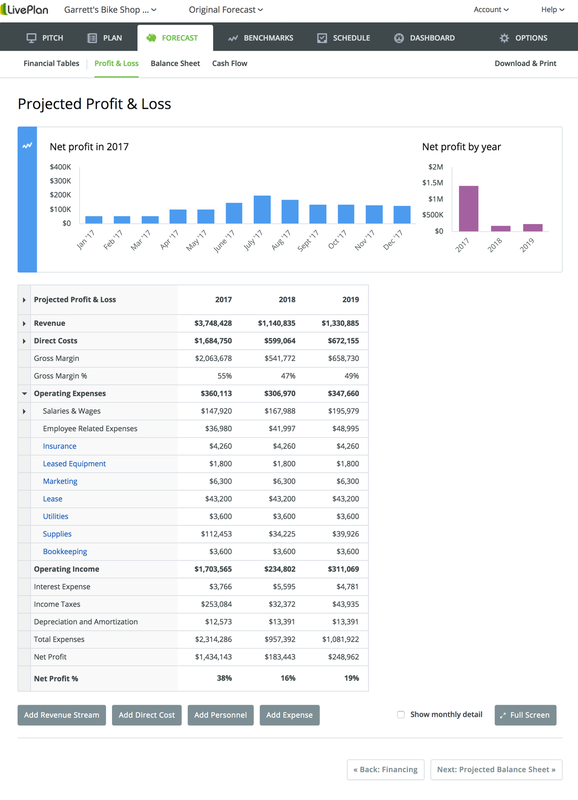 The profit and loss statement (also known as the income statement) in LivePlan, where you’ll find your operating expenses and operating income. How is operating income (EBITDA) different from your revenue or sales numbers? Operating income is what is left over after you subtract all of your expenses from your revenue, but before you subtract interest expenses, taxes, depreciation, and amortization. Calculate operating income by starting with your total revenue (sales), and then subtract all of your expenses, such as rent, marketing expenses, and salaries. If you’re paying interest on a loan or taxes, don’t subtract those expenses. The number you have at the end is your operating income. So, to calculate your profit margin or operating margin, divide your operating income by your overall revenue. If you have sales (revenue) of $1 million and operating income of $100,000, your profit margin would be 10 percent. Let’s face it, profit is one of the most important metrics that you track in your business. Besides tracking your cash flow and cash balance, understanding if your company is profitable is one of the keys to long-term success and growth. Because of this, you’ll need to understand profitability, why it’s important, and how you can improve it. While it’s tempting to just look at the raw number that is the infamous “bottom line” to determine profitability, it’s actually much more useful to look at your profit margin. Profit margin is just earnings displayed as a percentage of total sales or revenue. Looking at profit margin tells you what percentage of every dollar of sales you are bringing in over and above expenses. Most companies spend a lot of the money they bring in on operating expenses—supplies, production costs, labor, facilities, taxes, and so on. Calculating your profit margin can be helpful because if your margin is too low, even if you’re bringing in plenty of revenue (making sales), you can find yourself in the position of only being able to break even, or pay your expenses, without a lot left over. It’s hard to grow a company when all your sales just go to pay expenses. Knowing your profit margin also lets you easily compare yourself to other businesses to see how you are performing compared to your peers. Are you as efficient as other businesses like yours? Margins answer this question for you while absolute profit numbers do not. Profit margin shows you how good your company is at generating income from normal operations of the business, after you’ve spent money on marketing, sales, product development, and so on. Over time, successful companies should develop a higher profit margin. This means that the company is making more on each dollar of sales. To assess whether or not this is happening, compare the company’s quarterly or yearly figures to those of the previous year or quarter, and to competitors, if possible. What’s better? Higher or lower? A higher profit margin is generally better. If profit margins are growing over time, that means that the company is growing sales faster than it is growing expenses. The company is figuring out how to be more efficient and is keeping costs under control. But, startups and early-stage companies may have a low profit margin as they invest profits back into the business to continue to fuel growth and expansion. As a business matures, it will usually start to grow its profit margin. Trim operational “waste.” For example, cut down on raw materials used during the production process. Make the most of your employees’ time. Synchronize production processes, avoid long delays between tasks, and organize time better to avoid bottlenecking. Give idle employees something to do that will cut down on operational waste. Consolidate processes. Spend some time evaluating and analyzing the various systems you use to run your business. If something is inefficient, change it or get rid of it. The goal is to increase efficiency. Review your expense budget. To understand how to improve your profit margin, you need to know where you are spending money. Take a look at your payroll expenses, marketing budget, the cost of materials, and so on. Where is the money going? How can you cut costs? Compare your figures with industry averages. Once you’ve figured out where you’re spending your income, take a look at industry averages. How much is the industry spending on each part of their operations? Once you’ve figured this out, you will be able to look for more specific ways to improve your profit margin. In simplest terms, profit margin is a measure of your profitability and of your operational efficiency. A higher profit margin means that you are generating more profits for every dollar of sales. Unless your focus is to reinvest as much as possible into growing your company, you will want to aim for a higher profit margin. For more business concepts made simple, check out these articles on direct costs, cash burn rate, net profit, accounts payable, accounts receivable, cash flow, profit and loss statement, balance sheet, and expense budgeting. This article was originally published in 2014. It was revised in 2018.